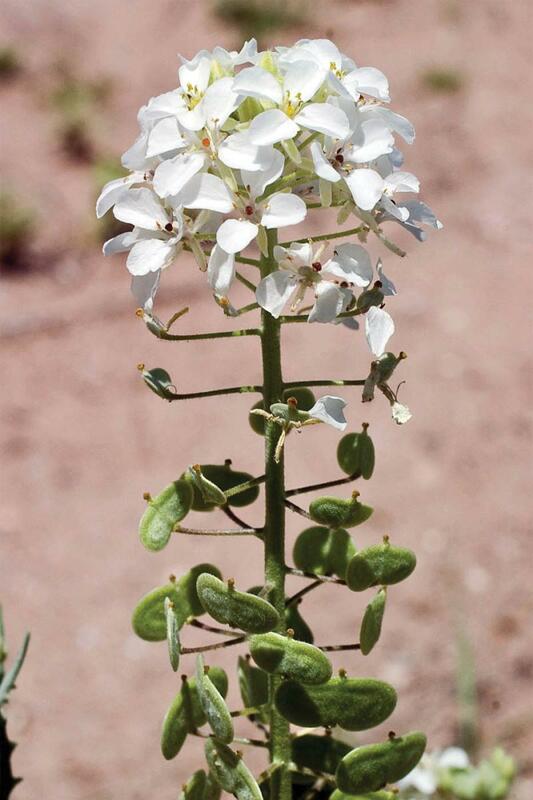 With 1- to 2-foot stems topped by round clusters of showy white flowers, this early-blooming mustard decorates road medians, trailsides, and disturbed areas. The paired seed disks spiral around the stem and resemble eyeglasses, hence the common name, “spectacle pod.” Though often considered a weed, its March blooms are an important early source of nectar and pollen for emerging bees, butterflies, and other pollinators. Southwest Indians considered the plant a multiuse medicine bottle. Powdered, it served as an antiseptic for cuts, while an infusion was used as a mouthwash and to strengthen gums. Historically, a concentrated decoction was given to “make men talk like fools,” which many consider no longer necessary.